Gift of Mr. and Mrs. Sidney G. Dillon, Oct. 10, 1991. Given by William V. Griffin or Charles Scribner to Mrs. Milton S. Dillon of Far Hills, New Jersey (née Vera Maud Cusman; married Milton S. Dillon, who died in 1939; married Catesby L. Jones in 1946; later married Eric F. Kerry; died June 1, 1991); given by Mrs. Dillon to Mr. and Mrs. Sidney G. Dillon in early 1991. 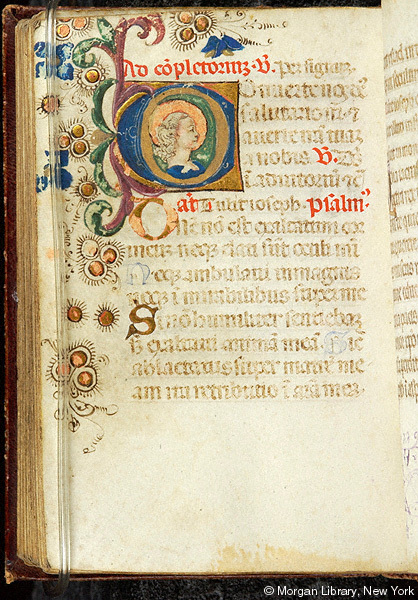 Ms. book of hours for the use of Rome; written and illuminated in Italy, possibly Florence, ca. 1470-1489. Decoration: 12 historiated initials, 7 inhabited initials, and 4 inhabited border roundels. Artist: according to Tilly de la Mare, in a conversation with W. Voelkle, 9 December 1992, possibly Antonio di Niccolò di Lorenzo.